There’s something special about gigs. You know it, I know it and chances are if you’re reading this, you’re fascinated by that something special, that change in atmosphere that can lead to tens of thousands of people blending into a single beast of flailing limbs, excitement and physical contact in a way incomparable to even the most important football fixture. It’s also a moment in which any number of ordinary people pile into a single venue to look up at people who at any other moment are ordinary themselves but with the presence of instruments become God-like figures in the eyes of the eager audience. There’s something special about The Stone Roses. You know it, I know it and chances are if you’re reading this, you’re fascinated by that something special, in which Northern lads become psychedelic pioneers pulling genuine musical poetry and fascinating prose from the doldrum images of a working class existence. They’re also the band in which each member becomes his own figure, commanding the crowd with riffs, a general sense of brilliance, perfect beats or bass-lines that defined a generation, or two. 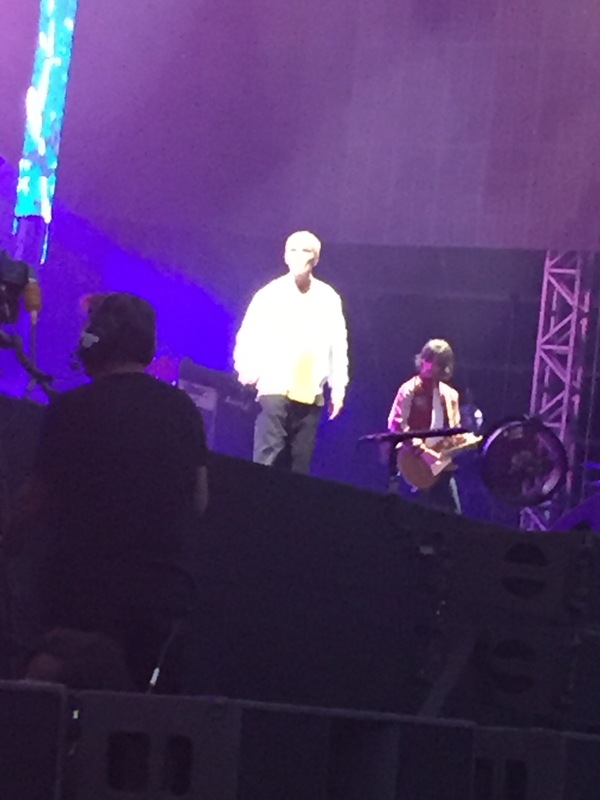 Of course then, Stone Roses gigs are that monumental kind of special, fluctuating between smooth, romantic feelings of unity and the stomach dropping excitement of being in the same room as those idols who have shaped your life in some, spiritual way. Imagine then this is coming off of the reunion that nobody ever believed could happen, the release of two successful singles and the gig is at Wembley, in front of 90,000 people, the band’s first London performance in four years. That is the level of magnitude that lead to me and so many other fans descending from the nearest tube and turning the Wembley Walk into a sea of bucket hats and cans of lager. The support bill for this event was incredibly strong, Sleaford Mods spat at a crowd of bemused onlookers either appalled or enthralled, The G.O.D left little to no impression and Blossoms were typically crowdpleasing with a selection of perfectly pleasant melodic ballads. In between these sets was a DJ who looked incredibly like Labour Leader Jeremy Corbyn and played a selection of anthems from Friday Night, Saturday Morning by The Specials to Weekender by Flowered Up. This political doppelgänger was nothing more than coincidence and yet felt somewhat symbolic as positivity and optimism flowed through the Wembley atmosphere and, for the first time in years, the political landscape also. These choices ultimately, and predictably, concluded with Stoned Love that lead to a sinking in my heart and presumably that of those around me also as we all knew that within moments The Stone Roses would grace us with their collective presence. The band entered the stage in typically impressive fashion with amazing outfit choices and football chants from every area of the overwhelming arena. Within moments, Mani’s iconic bass line swam through the air and things changed for good. The slow, rhythmic rise of this track is as goosebump inducing as any other in history and it’s effect on a crowd is immeasurable and unparalleled, in these few moments, anything seems possible, the world reaches harmony and every member seems to shift in nature: Brown’s persona grows ten feet, Squire’s hair flows in a non-existent wind, Mani’s smile lights up the screens projecting across the venue and Reni’s loops fill the ears of adoring fans. It sounds hyperbolic but any fans know, this moment is a revelation no matter how many times you are a witness of it. And from there, the set list goes from strength to strength as The Roses’ every track is backed by the sound of eager audience accompaniment across every beat and note. From the otherworldly jangle of Elephant Stone, the beloved wails of Sally Cinnamon, the band cruise their way through a selection of greatest hits, slowing down for the balladic cascades of the psychedelic beauty that is Where Angels Play, making room for the surreal Beggin You and of course concluding with a sure fire double hit of This is the One and I Am the Ressurection, both of which move a crowd in ways that no other band seem to have quite mastered. With this near flawless setlist, the band seeming truly comfortable and the fans all pleased, The Stone Roses at Wembley Stadium was another perfect arena date from the band that continue to surprise us. However, on a deeply personal level, this concert holds within it possibly my fondest memory, the memory of mine and Ian Brown’s interaction. 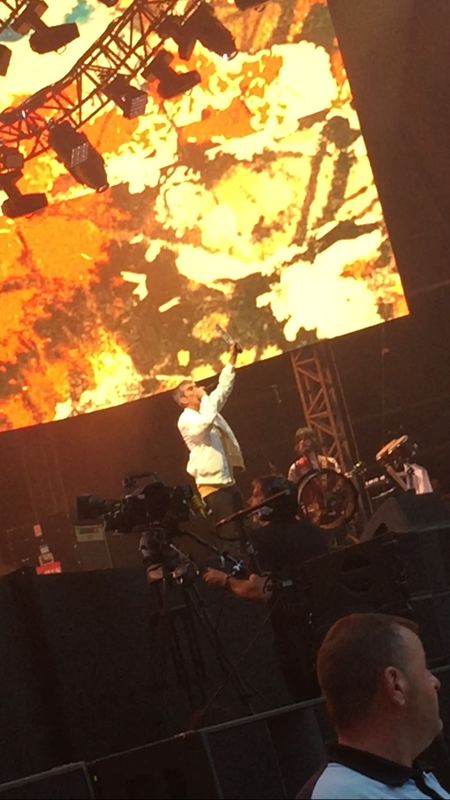 Any fans of The Roses will know, I am sure, that at many points in most Stone Roses gigs, Brown throws tambourines out to members of the crowd. Towards the latter half of this particular set, having previously made eye contact with him, Brown strolls over to our side of the impressive stage and looks around for someone who deserves the privilege of his own tambourine and by the time he has reached us I am already halfway thrust over the barrier that separates me and the band, pleading for the tambourine and after some teasing, Ian does oblige and throws it to me, however it is snatched by a man just to my right: a devastating moment and yet one instantly redeemed by Brown’s promise that he will get me one regardless. And two songs later he did. As if something out of my most fantastical dreams Brown, in front of 90,000 other fans, passes me, through security, the blessed tambourine and the treasure I now most value. It is needless to say that following this, my night turns into a single stream of euphoria passing through my every fibre intensifying particularly during This is the One in which the genius of the track and my own searing glee begin to truly amalgamate. Following this, rumours of The Roses imminent split turn to truth as Brown confirmed to the Hampden park audience that we should all “be happy it happened.” And how I was, my favourite band of all time had reunited, released two brand new and utterly terrific singles and on my second time seeing them had provided me with a memory I shall never forget, nor will I ever want to. Thanks very much! It was truly an experience! Maybe Mani as foreign secretary?